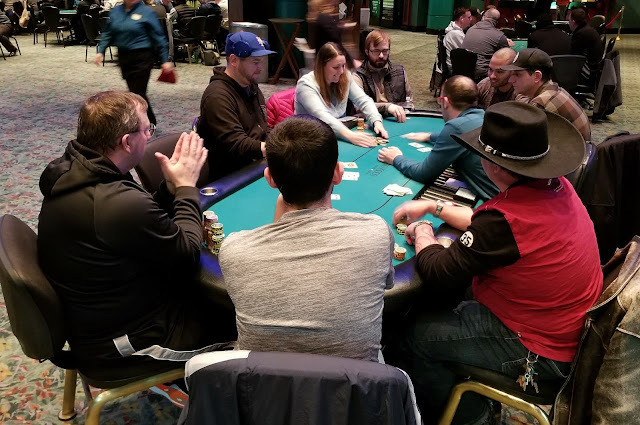 Facing a raise from Stephen Song in middle position, a player in later position moves all in for less than ten big blinds. Song calls and says, "I run pretty good," so we will see. The flop comes Q♠8♣3♦, increasing Song's lead to a pair of queens. Unfortunately for his opponent, the 4♠ turn and 8♠ river do not improve his hand, and he is eliminated in 46th place, with 45 places paid. Here is a look at a few of the notable stacks heading into the last level of play prior to the 60-minute dinner break. 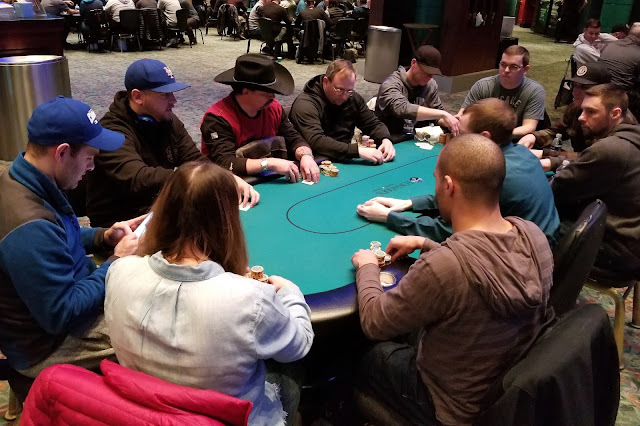 There are ten players remaining in Event #3, and seven of the players will make the money. For a look at the full prizepool/payout schedule for this event, please see this link. 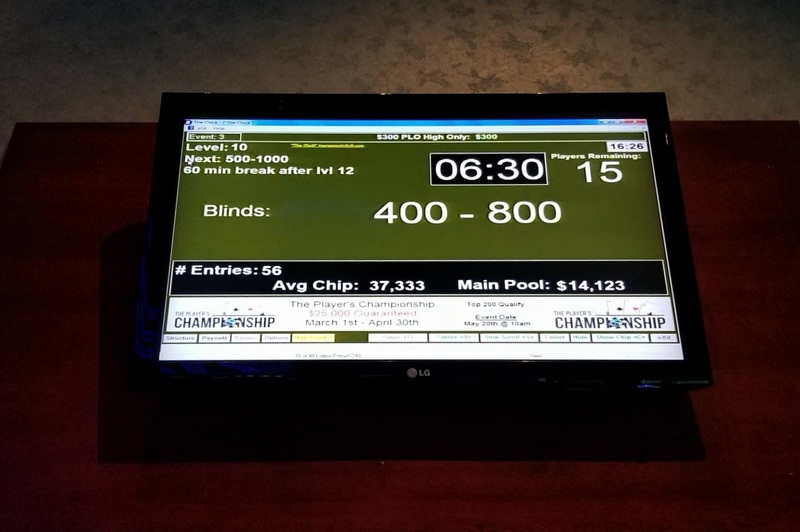 There were a total of 56 entries in today's $300 PLO High Only Event, generating a prizepool of $14,123. 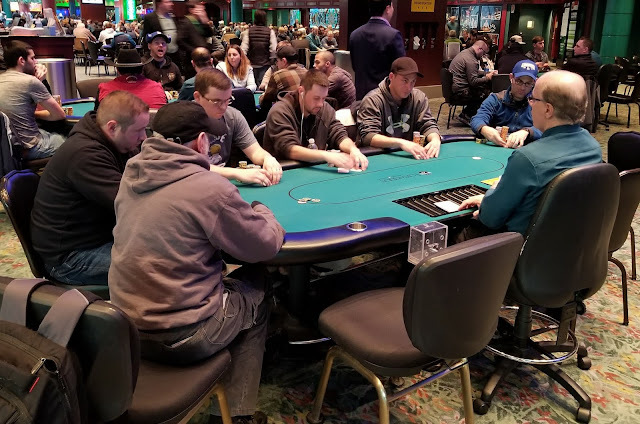 The top seven places will make the money, with first place taking home $4,590. There were a total of 373 entries in the second of three starting flights in the $600 No-Limit Hold'em Re-Entry Event #1. The field will play down to the 45 players before bagging and tagging later tonight. 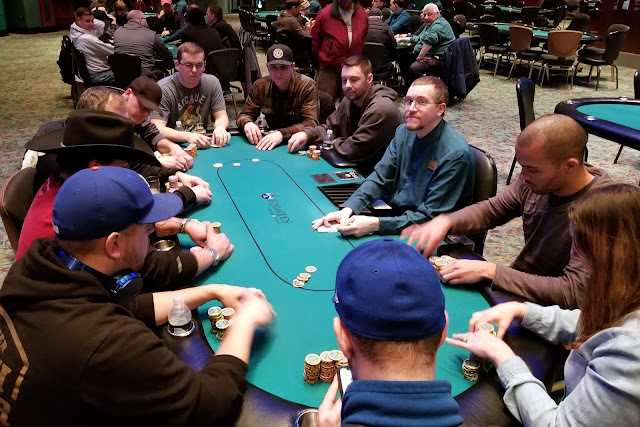 Those 45 players will join the 30 players that advanced in Flight A, and any that bag in the final Flight C tomorrow, and will return to play Day 2 on Monday at 11:00 am. 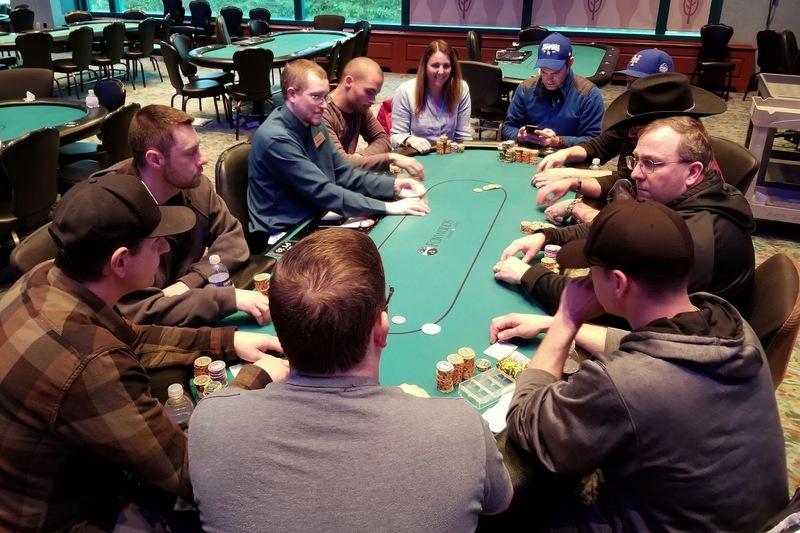 All players that make Day 2 will return in the money, and any player that bags in multiple flights will take home $1,200 for each additional stack they bag, with only their largest stack advancing to Day 2. There are three players to see the J♦10♦7♥ flop. 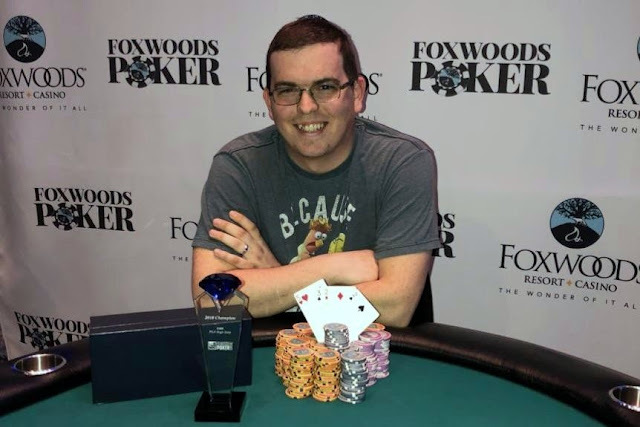 Zachary Baker checks in the big blind, a player in early position bets 2,000, the cutoff calls, and Baker moves all in for 8,150. 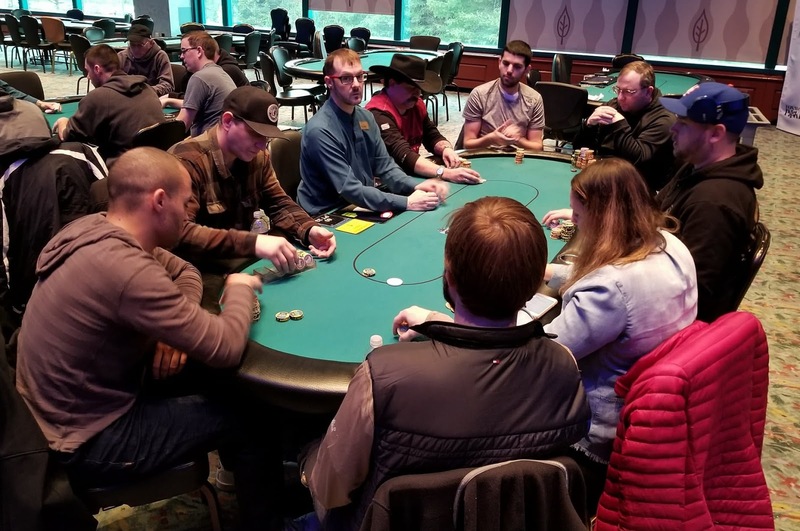 After confirming the 8,150 total, the player in early position also moves all in, for around 12,000, and the cutoff laughs before shrugging his shoulders the folding. The Q♠ turn does not change the hand, but the 7♦ on the river gives Baker a flush to double up. Players have just started Level 8, and there are already 344 entries in the second of three starting flights. Registration remains open until the start of Level 9, so it's likely the field will surpass 350 entries. Yesterday's Flight A saw 243 entries, with 30 players making the money, and bagging up chips at the end of the evening.